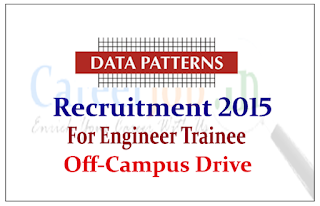 Data Patterns is hiring for the post of Engineer Trainee. 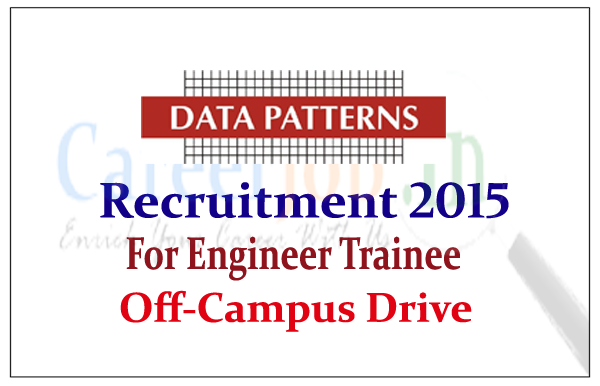 Interested and Eligible candidate can attend the off-campus drive on 30th June 2015. Company Profile: Data Patterns is India's leader in indigenously developed electronic systems in the Defence and Aerospace domain. Data Patterns' key strength is founded on it's 30-year history of developing high reliability products in this domain with the broad capability to develop and manufacture any high reliability product. Data Patterns has developed several electronic systems for it's customers with the support of it's captive manufacturing facility and attention to detail. Data Patterns achieves it's philosophy of manufacturing products with the reliability of life span expected in it's market domain. How to Apply: Interested and eligible candidate can attend the off-campus drive Interview to mentioned venue on 30.06.2015.